The Rockford IceHogs have been on fire to start the 2014-15 AHL season. Win or lose, this is going to be a fun team to watch. Heading West on I-90, it’s mostly win for the Hogs. Rockford has won a franchise-record eight straight and is 10-2-0-1 in a baker’s dozen of games. The IceHogs are on top of the Midwest Division and hold the second spot in the AHL’s Western Conference standings. Mark McNeill’s goal explosion has been a big part of the current surge. Right now, McNeill resembles a bald, mustached Alfred E. Neuman (I’m not just setting up my next line-he goes with the shaved head look, he’s missing a front tooth and Brovember accounts for the peach fuzz on his upper lip.). However, it’s his opponents who are doing all the worrying. Skating with Phillip Danault and Garrett Ross, McNeill posted six goals in Rockford’s three games. That included the equalizer in a two-goal performance Tuesday as well as the. game-winners on Thursday and Saturday. 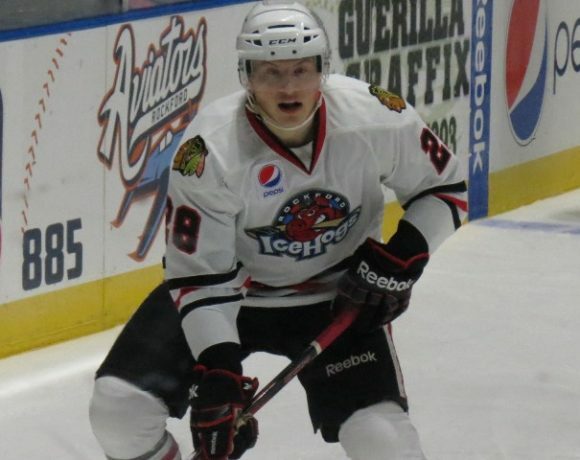 Saturday saw McNeill post his first hat trick as a professional, providing all the offense for the IceHogs. The 6’2″ forward has been a big part of what has been Rockford’s best line recently. McNeill currently sits atop the AHL in goals with Albany’s Paul Thompson with nine. His 15 points place him fourth among league scorers. UPDATE-The AHL, as I suspected they would, named McNeill the CCM/AHL Player of the Week Monday. Congrats go out to him. One key ingredient to Rockford’s terrific start is the current goal tandem of Michael Leighton and Scott Darling. Leighton was in goal for the first four wins of the streak and Darling’s play has just been impeccable. With these two patrolling the crease, the IceHogs have a solid chance to win every night. Leighton’s 2.32 goals against average is a bit misleading after the veteran was victimized for four power play goals Tuesday night. There were a few catcalls when coach Ted Dent pulled Leighton but I felt the move was more to send his skaters a message. A flat Rockford penalty kill, which was perfect at home this season, was more to blame for the quartet of goals than Leighton. The dam-breaker came when Dennis Rasmussen allowed Maxim Noreau to walk in from the point all the way into the slot, get set in front of Leighton, check his voice mail and fire home the goal. Darling is becoming just that with the Rockford fans, but I didn’t think Leighton (who won us a game at Grand Rapids just last week with 38 saves) deserved blame for the four-goal deficit. This was a wake-up call, pure and simple. It was also an effective wake-up call, because the Hogs stopped taking penalties and were able to rally to win the game in overtime. Darling saved 12 Monsters shots, including one in the final stanza that could well become the stuff of Rockford legend. Down 4-2 and nearing the midway point of the third Tuesday, Darling made what might be the save of the year to foil Lake Erie’s attempt to add an insurance goal. While making a pad save on Colin Smith at the left post, Darling left a juicy rebound which Mike Sgarbossa picked up in the slot. In a play that would make Robin Ventura proud, Darling dove to his right and got his glove on the puck, knocking it safely to Pierre-Cedric Labrie. The Hogs were able to pick up two points specifically because of this play. Leighton was back in net Saturday and posted another win, allowing just one goal against Grand Rapids. After a 2013-14 campaign in which you came to the rink hoping Kent Simpson was wearing a ball cap, Rockford is as deep in net as they have been in several seasons. The pressbox was full by the looks of it Tuesday night. I’m guessing many of them (including ESPN.com’s Scott Powers) were there to get a look at Teuvo Teravainen, who had a goal and six assists in his first ten games. Tough luck, guys. Teuvo was sick. Teuvo battled an illness that kept him out of action for both Tuesday and Thursday’s games. He did talk to reporters, including Powers (the story he posted is here). It sounds like the Hawks best prospect is, in fact, dealing with the adjustment to the smaller ice surface of North American hockey. His play has been decent, but he certainly hasn’t been his team’s best player up the middle (see Danault, Phillip). Teravainen is a minus-three on the year, the worst such plus/minus on the roster. Teravainen is being encouraged to take his shot and to get the puck up the ice. He’s living in The Rock with fellow Finn Ville Pokka, so that has to help with his comfort level. Spoiler alert-he doesn’t exactly dig playing dump-and-chase. He may not like it, but he’d better get used to it. A couple of seasons ago, Brandon Saad spent the first half of the season with the Hogs while the NHL settled that whole work stoppage thing in 2013. Saad’s play in Rockford was a little underwhelming (if Ben Smith doesn’t break his hand just before the Hawks started up, things may have turned out differently), but he was able to step up his game once he donned the Indian head sweater. I mention this to illustrate that Teravainen doesn’t necessarily have to dominate to get better in his time in Winnebago County. If he wants to break out with some highlight-worthy play, however, I won’t say him nay. Rockford’s defensive corps is deep…perhaps too deep. Coach Ted Dent has skated seven defensemen on several occasions this season to get playing time to the host of talent on the blue line. You have to figure that something has to give on the defensive side. Adam Clendening, who set a points record for Hogs defensemen a year ago, is being caught in the numbers game to a certain extent. He hasn’t matched last season’s hot start and has a goal and four helpers to his credit in 13 games. Much of this can be attributed to a decrease of ice time as T.J. Brennan, who was obtained from the Islanders in the Nick Leddy trade, is an offensive defenseman who shared First Team AHL honors with Clendening in 2013-14. The Hawks basically brought in a player who plays Clendening’s game as well or better than Clendening. Brennan has eight points (2G, 6A), is a plus-ten and has substantially cut into Clendening’s power play time. Pokka, who also came over in the trade, has recently recovered from an injury and has impressed since joining the lineup. Kyle Cumiskey, another offensive-minded defender with wheels, suffered an injury (rumored to be between the ears) in Thursday’s morning skate with the Iowa Wild. Whether Cumiskey misses a little or a lot of time, there is still a glut of defenseman on this roster. It may take a trade to thin the heard and get a guy like Clendening the minutes he needs to continue his development. It appeared that Rockford was going to throw out a stinker in their first home tilt in over a week. Instead, a light weeknight crowd was treated to an excellent come-from-behind effort, culminating in Peter Regin’s second overtime winner of the season. Tripping penalties by Ryan Hartman and Brandon Mashinter resulted in two Monster power play goals. Six minutes into the contest, the Hogs found themselves down 2-0. A Ville Pokka power play one-timer from the left circle cut the lead in half early in the middle frame. T.J. Brennan set up Pokka’s second goal of the season. Unfortunately, two more Lake Erie goals with the man advantage saw Michael Leighton head to the bench in favor of Scott Darling and Rockford down 4-1, a lead the Monsters took into the second intermission. 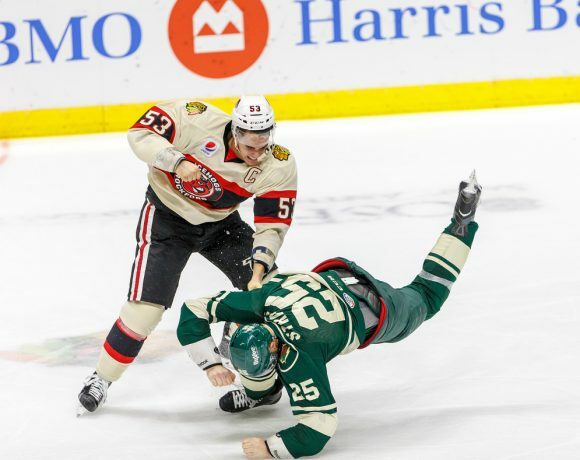 The IceHogs, who had dominated at even strength despite the lopsided score, began to slice into the Lake Erie lead as the shots began to fall. Mark McNeill took a feed from Garret Ross in the slot to close the gap to 4-2 two minutes into the third period. In the 14th minute, McNeill would take another feed from Ross, this time from the left half-boards just as McNeill was entering the Lake Erie zone. McNeill skated to the left post and slipped a backhand past Calvin Pickard’s stick side, cutting the Monster’s lead to 4-3. The comeback was completed with 1:40 remaining. Regin took a pass from Joakim Nordstrom in the neutral zone as coach Ted Dent was motioning for Darling to come to the bench. Regin skated across the blue line and threw a shot on goal. The puck looked like it went off of defenseman Stefan Elliot and over Pickard’s glove to the back of the net. In overtime, Regin was on the ice with Nordstrom and T.J. Brennan. Brennan blocked a Maxim Noreau shot and headed up the ice with Regin following up the right side. Brennan drew the defender and slid the biscuit to Regin for the game-winner 5:10 into extra time. To the surprise of no one, Regin was awarded the game’s first star. McNeill, who played on the most dominant line of the evening with Danault and Ross, was second star. Scratches-Zach Miskovic, Cody Bass, Teuvo Teravainen, Alex Broadhurst, Ryan Schnell. The Hogs got off to a fast start in a rare morning contest, withstanding a run by the Wild to extend their winning streak to seven games. This time, it was Rockford’s turn to race out to a big lead. Pierre-Cedric Labrie was in front of the crease to put back a rebound of a Matt Carey shot in the sixth minute to get the IceHogs on the board. Joakim Nordstrom got to the doorstep on a Rockford power play in the 13th minute and lit the lamp via a pass by Brandon Mashinter. Drew LeBlanc found the net for the first time this season 5:18 into the second, taking a T.J. Brennan shot attempt off the end boards and banking a backhand off Wild goalie John Curry. Mark McNeill got hold of a loose puck at the top of the right circle near the end of an IceHogs power play. Rubber and twine united and Rockford owned a four-goal lead. Iowa stubbornness gave the throng of youngsters who had the day out of class to watch the Wild a bit of hope by scoring a pair of goals in the last two minutes of the middle frame. They drew to 4-3 early in the third. However, Nordstrom prevented what would have been a 180-degree turn from Tuesday by striking gold on the power play again. This one came midway through the period with helpers from Adam Clendening and Kyle Cumiskey to re-establish control of the contest. Nordstrom and McNeill were the first and second stars, respectively, while Darling stopped 30 of 33 shots to move his record to 5-0 on the season. Scratches-Zach Miskovic, Viktor Svedberg, Teuvo Teravainen, Ryan Schnell. The IceHogs fell behind early but got a natural hat trick from Mark McNeill to extend the franchise-record win streak to eight games. Twenty-five hundred camouflage hats were handed out before the contest, though only a few dozen were cast onto the ice at the end of the evening. The Griffins scored first in the fourth minute when Landon Ferraro snuck around the left post from behind the Rockford net to get the better of Michael Leighton. It was the only time the veteran net-minder would be fooled on the night as he stopped the next 24 shots he faced. McNeill was at the left post to knock in a T.J. Brennan rebound to light his first lamp of the evening midway through the opening period. His second goal, which turned out to be the game-winner, came on an excellent drive to that same post. With no passing options, McNeill backhanded a shot off the defenseman and into the basket to give the IceHogs the lead midway through the third. Rockford’s penalty kill was aggressive on this night, as opposed to Tuesday when it allowed four goals. 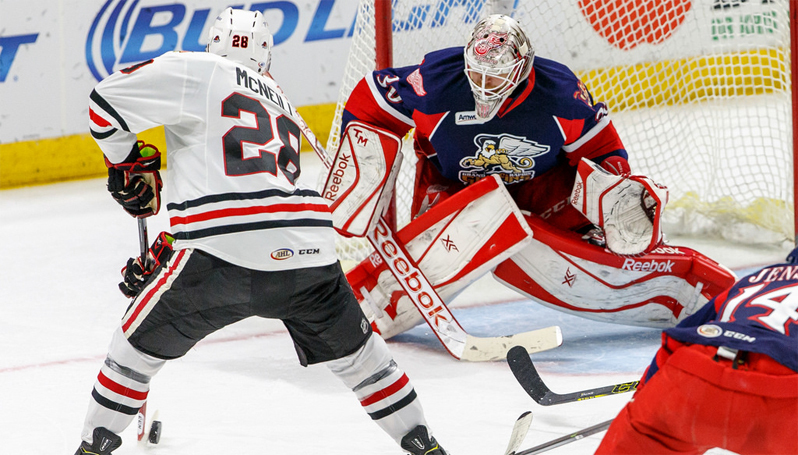 The IceHogs killed off consecutive penalties by Garrett Ross and Phillip Danault midway through the final stanza. Leighton withstood a late blitz on the crease once Grand Rapids pulled Tom McCollum from the crease for an extra skater in the final minutes. The natural was completed when McNeill backhanded the puck from neutral ice into the empty net in the final minute. McNeill was tabbed the game’s first star, with Leighton garnering second star honors. Scratches-Zach Miskovic, Kyle Cumiskey, Alex Broadhurst, Ryan Schnell. The Hogs are off until the weekend, where they have three games in three days. Friday and Saturday is a home and away with the team behind them in the division, the Milwaukee Admirals. Sunday, Rockford will host the Texas Stars. If you wanted to go check out an IceHogs game but aren’t a fan of paying money to do so, no need to commit fraud and wind up in prison. You can get free tickets to Sunday’s tilt by going here and scrolling down the right side.